Is your sales force not producing the results you want and lacking the energy, teamwork, drive, and the attitude that they need to have for great success? Are you a sales professional or sales manager who is carrying around too much stress, lacking motivation, and not achieving your full potential? If any of this is true, then listen up. Laughter just might be the solution. You can immediately reduce stress, increase productivity, teamwork, focus and motivation for your entire organization or team with laughter. The bottom line impact from improving all of these factors means better sales results. As a former director of sales for multiple organizations, I was always looking for innovative ways to motivate my entire sales force. I wish I had known about laughter exercises at that time! There has never been a simpler way to bring more laughter into the workplace, until now. The most powerful and effective way to bring laughter into the workplace is to hire a certified laughter yoga leader like myself, to conduct a laughter seminar. Many professionals have experienced the benefits of laughter exercises first hand, yet laughter seminars are still far from being mainstream. When I have conducted laughter seminars, it is not uncommon for perceived motivation and productivity to nearly double, right away. Unbelievable, right? While there are many tools available for stress management, laughter seminars provide a unique system that helps to reduce physical, mental and emotional stress at the same time. It works simultaneously both on the body and mind. Performance is connected to attitude, and laughter has the power to change the attitude and mood within minutes by releasing neuro-peptides from the brain cells called endorphins. “People who laugh together, work together” John Cleese, a renowned British comedian, once said during his visit to Mumbai for a laughter seminar, that laughter is a great connector of people. It breaks all hierarchies and is a force for democracy. Laughter has the ability to change the work environment drastically by making people happy and cheerful, bringing positive mental attitude, and optimism into the sales force. It also increases communication skills which further help in team building. Some of the most creative people in the world are children. The essence of laughter exercises is to cultivate childlike playfulness. This playfulness stimulates the right brain activity which is where the creativity originates. This helps to generate new ideas and insights about sales challenges and problems. Studies have shown that even after just 30 minutes, the concentration levels start to decrease. 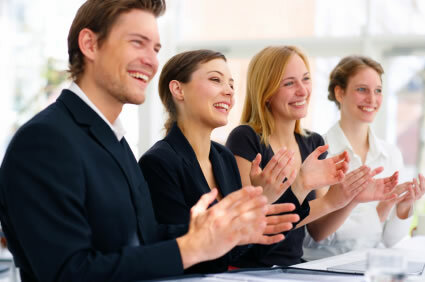 A brief laughter seminar can provide a great energy boost during a full day of training, meetings or conferences. Sales job dissatisfaction can compel people to change jobs more frequently which will affect productivity and profitability. Laughter creates positive energy and improves communication between people. Studies have shown that positive emotions are increased while negative emotions are decreased from laughter. Happier, more balanced employees increases loyalty and commitment. Laughter helps to bring a smile on the face and generate good feelings within the body. This enhances communication and motivation. Positive energy is contagious, and will be felt by prospects, clients, and the entire sales organization. These are just some of the many reasons why you should consider a laughter seminar to increase your sales results. Most sales leaders have tried just about everything to increase sales results and motivate their sales force; however, it has not been until now, that laughter has been viewed as a viable solution.